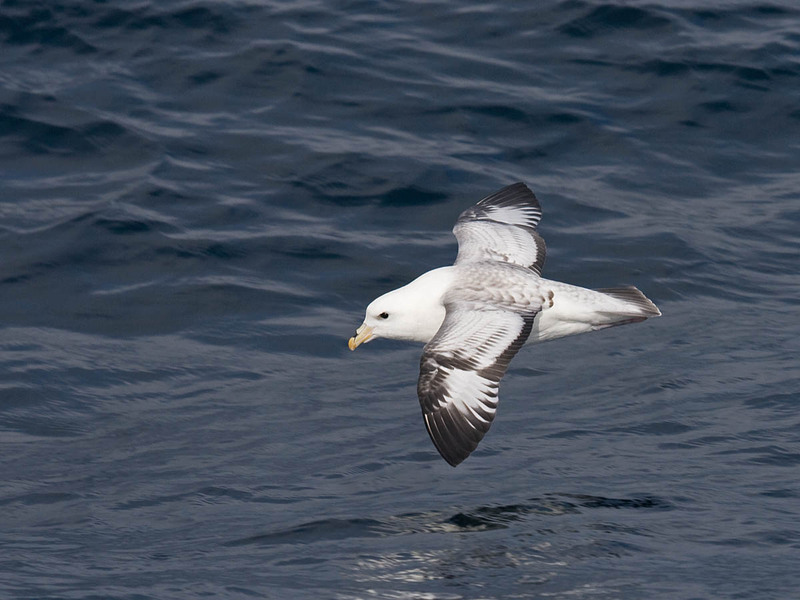 Dark and light phase Northern Fulmars. Click for larger view. 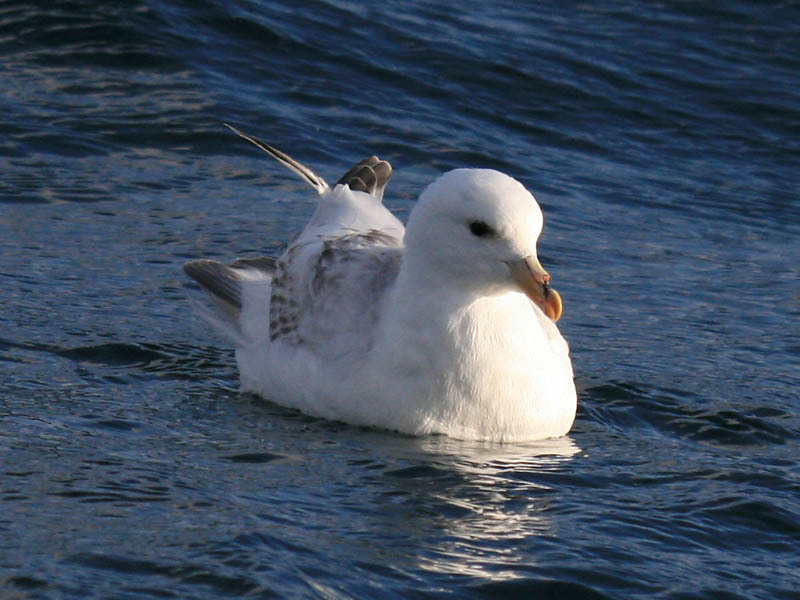 Northern Fulmars come in a variety of colors and patterns--from dark blackish-brown to various shades of gray, bluish, tan, yellowish, and white,... patterned light, dark, speckled, checkerboard, and plaid (but not yet seen in a barber pole pattern). 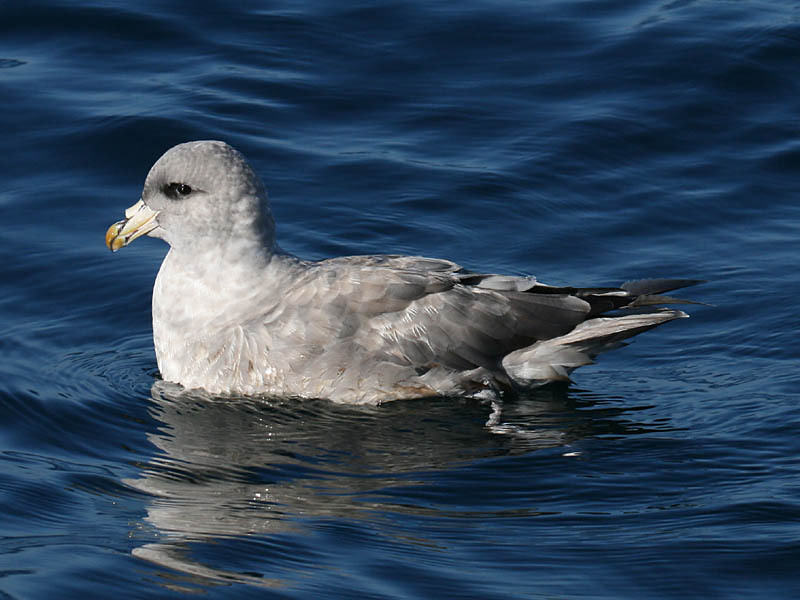 On the West Coast, the majority of fulmars are dark phase. These birds are pretty much all dark except for pink feet and thick yellow bill. 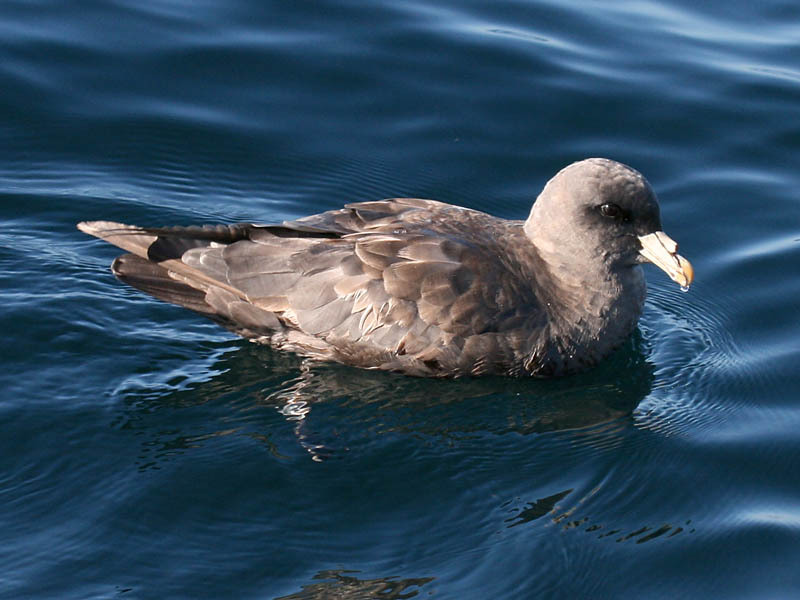 Many of the birds are dark sooty gray. Older feathers become brownish. 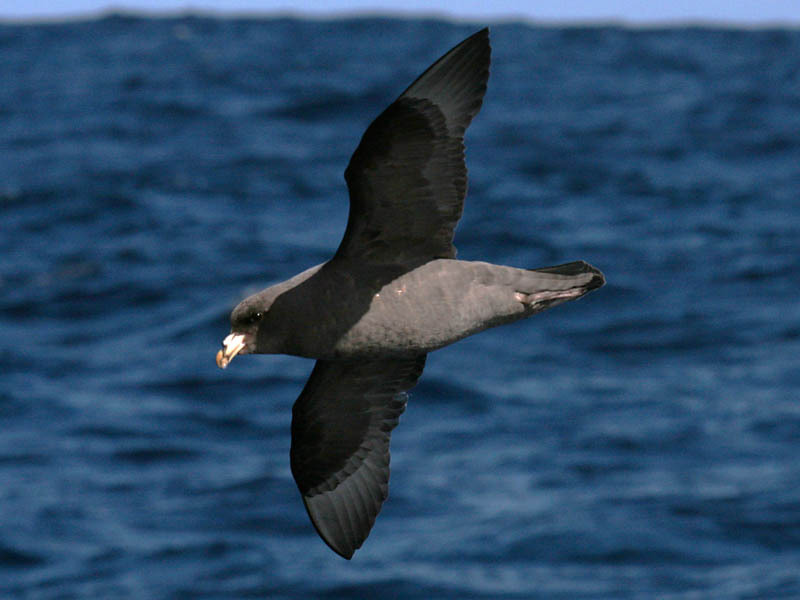 Darkest examples can suggest Flesh-footed Shearwaters with their dark chocolate-brown plumage and pale bill. 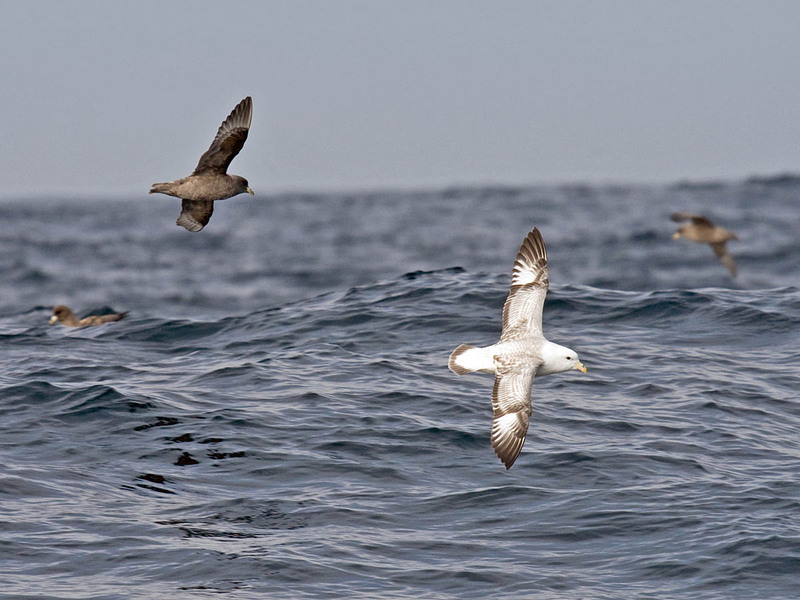 Shearwaters, however, have longer wings, tail, neck, and bill. See the next 3 photos for examples of the darkest birds. Click to view how some hold their feet above their tail! 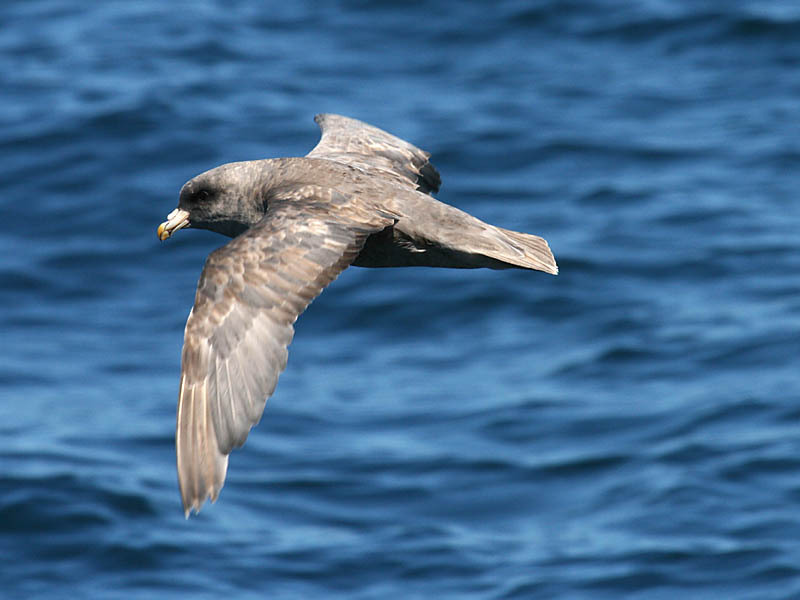 Fulmar pretending to be some other all-dark petrel or shearwater! 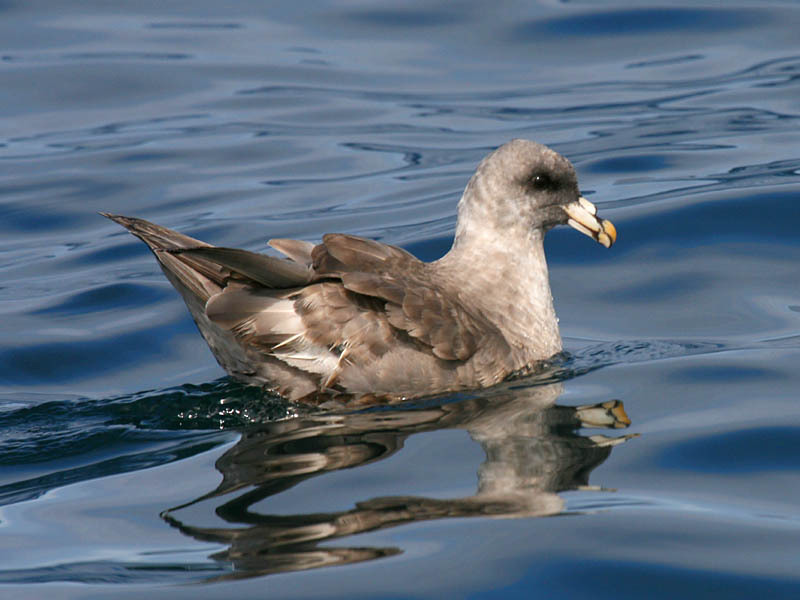 The vast majority of birds nesting in the Aleutians are dark phase. In contrast, most of the birds on the Siberian side of the Pacific are light phase. Most birds aren't as dark as that shown above. Many are just plain gray or pattened with new darker gray feathers replacing worn and faded browner feathers as the 2 photos below show. Note faded brown outer primaries contrasting with new gray ones. Slightly paler, birds such as those in the next 2 photos are a bit paler gray-brown on the body plumage with darker wings. During molt they can be very blotchy and oddly patterned. Older feathers tend to tan, or even with a yellowish cast. First year bird with relatively fresh flight feathers. Very worn wings (note feather shafts without barbs on wing). 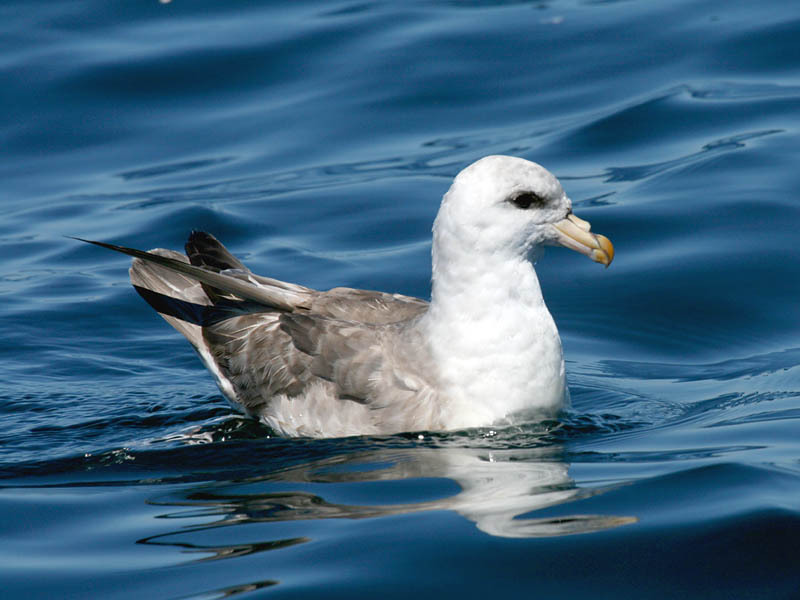 Atlantic Northern Fulmars have light and dark phases, but none are as extreme--at either end of the spectrum--as Pacific birds. 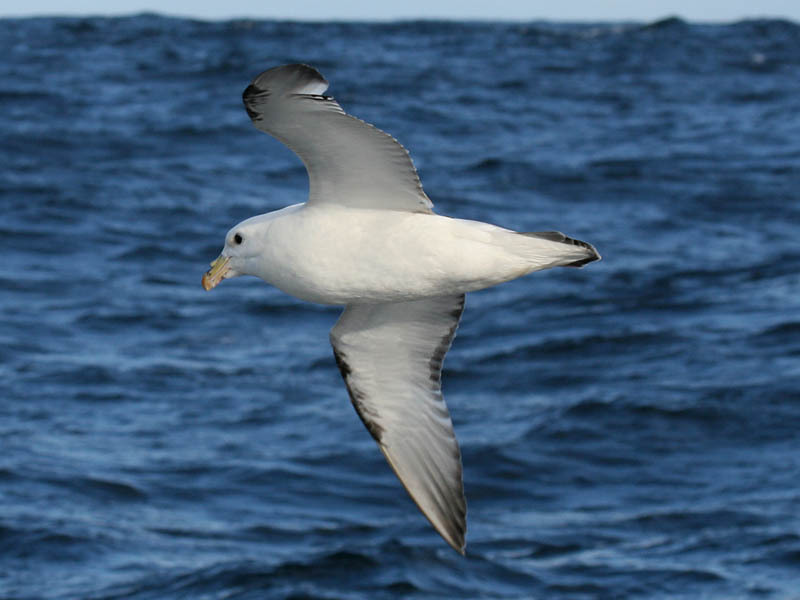 Pacific Fulmars have thinner bills and dark tails rather than white in Atlantic birds. 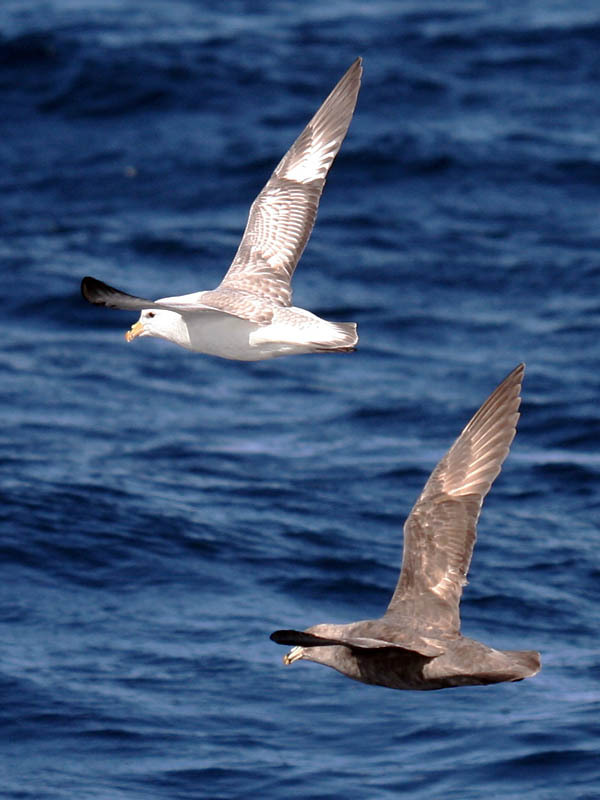 The birds in the next two photos appear as many do in the Atlantic, gray back and wings and white body (though with dark tails in the Pacific). 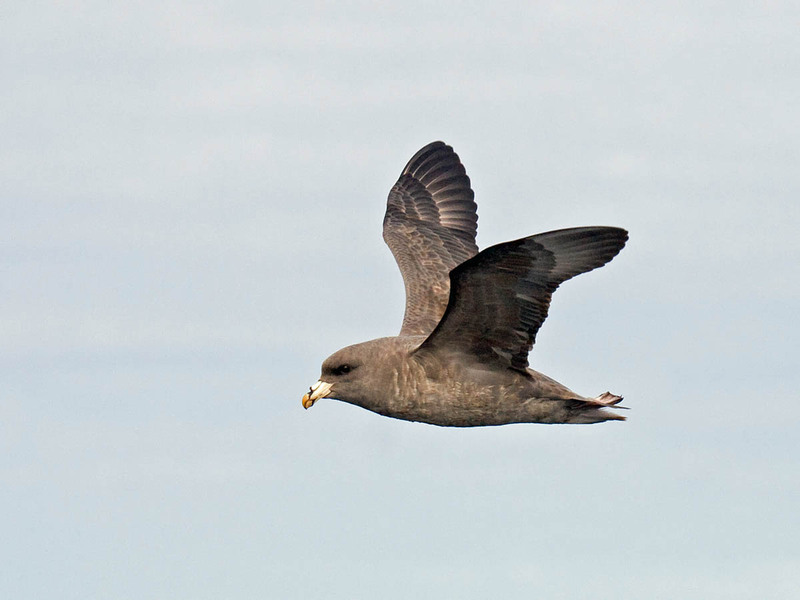 On the West Coast, however, fewer seem show the strong upper wing pattern as the following bird. 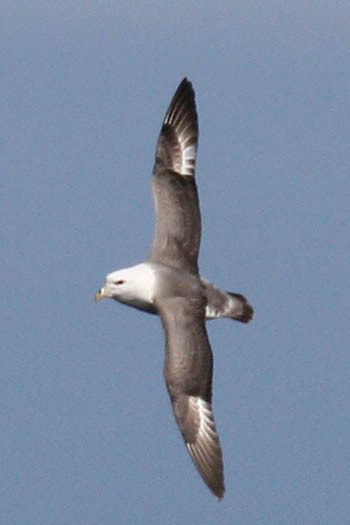 The paler the bird, the more strongly the white wing patches seem to contrast. 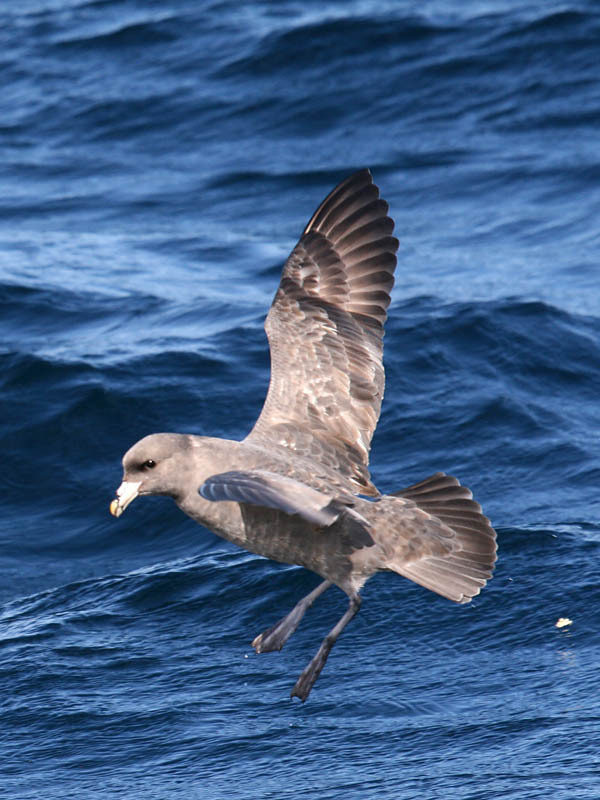 Especially in winter and spring there are many lighter phased individuals on the West Coast. Few get as white as the birds below, with all white body plumage including most of the back.